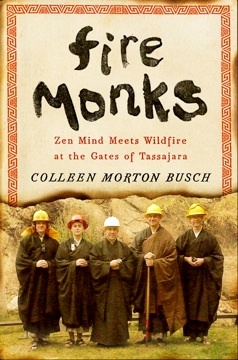 Fire Monks: Zen Mind Meets Wildfire at the Gates of Tassajara by Colleen Morton Busch tells the story of how the fires in 2008 affected Tassajara, the oldest Zen Buddhist monastery in the United States. Set deep in the Ventana wilderness east of Big Sur, the center is connected to the outside world by a single unpaved road. If fire were to enter the canyon, there would be no way out. Disaster struck during the summer months, when Tassajara opens its doors to visitors and the grounds fill with guests expecting a peaceful respite. Instead, the mountain air filled with smoke, and monks broke from regular meditation to conduct fire drills. All visitors were evacuated, and many Zen students followed. A small crew of residents and firefighters remained, planning to defend Tassajara. But nothing could have prepared them for what came next. When a treacherous shift in weather conditions brought danger nearer still, firefighters made the flash decision to completely evacuate the monastery. As the firefighters and remaining residents caravanned out the long road from Tassajara, five monks turned back, risking their lives to save the monastery. Fire Monks is their story. A gripping narrative as well as an insider�s portrait of the Zen path, Fire Monks reveals what it means to meet an emergency with presence of mind. In tracking the four men and one woman who returned�all novices in fire but experts in readiness�we witness them take their unique experiences facing the fires in their own lives and apply that wisdom to the crisis at hand. Relying on their Zen training, the monks accomplished the seemingly impossible�greeting the fire not as an enemy to defeat but as a friend to guide. Forthcoming on July 7, 2011 from Penguin Press. Live radio show at 1pm PST/3pm CST on Wisconsin Public Radio�s Here on Earth. Click here to learn how to listen or call in. This special kickoff event will celebrate the publication of Fire Monks with a talk by Abbot Steve Stucky, a short clip from a film documentary-in-progress, a reading by the author, and discussion with wildland firefighters and fire monks from the 2008 and previous Tassajara fires. Book signing after the regular Sunday program.